Highest Quality: GREEN + Stamp: BEST: FREE Shipping in Canada & Lower 48 States These Australian Medical Sheepskins are for people who need pressure reduction for Pressure Sore Prevention and improved comfort while in a bed or chair. Use 24/7 for maximum effectiveness. These are the " Gold Standard" of Medical Sheepskins because of their WOOL. Specially selected very-fine wool Merino lambskins have a very high wool pile density and optimal fine wool characteristics. Only 1 in 20 lambskins produced in Australia are good enough to meet this recognised Standard( AS4480-1 1998) for Australian Medical Sheepskin. HiTemp means that these Medical Lambskins (aka Sheepskins ) have been specially tanned to enable washing in water and Woolskin up to 80 oC and drying up to 60 oC. These numbers are important for sheepskin and wool disinfection; an important consideration for clients who already have pressure sores. HiTemp UR Australian Medical Sheepskins are Warranted for up to 50 washes in Woolskin, when the described washing procedures are used. A care tag is sewn on each Sheepskin. homogeneous wool pile of uniform length and density, well-defined staple and crimp, straight to light curl in appearance, free from pilling and vegetable matter. Wool shall not be felted. leather is free from excessive natural fat and grease, free of faults, symmetrical. Can be further processed to give increased urine resistance and labelled accordingly. Leather shall not give off any pungent or rancid odour. HiTemp wool colour must be Medical Green. Wool fibre diameter shall be 26-34 µm and be 25- 30 mm long. Flatness- at all times, the product should lie flat on a horizontal surface with minimum curling around the edges. HiTemp Medical Sheepskins must have a minimum shrink temperature of 110o C and should not decrease more than 5 oC after 5 wash cycles. Must be colourfast. All certified Australian Medical Sheepskins are a medical green colour. 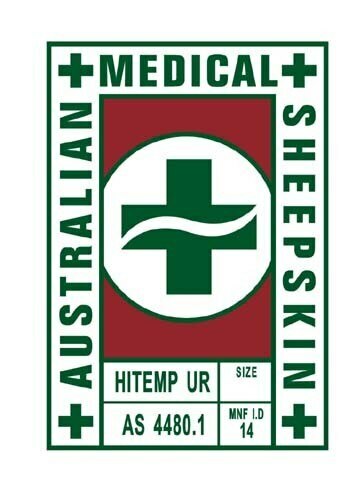 All of our Australian HiTemp UR Medical Sheepskins conform to the above standard and are warranted by Shear Comfort for up to 50 washes; when washed in Woolskin using the prescribed procedures. The letters UR designate that the skin has increased resistance to urine; making them suitable for incontinent patients. Sheepskins without this UR stamp will break down in the presence of urine. Urine will cause the leather to crack and the wool will fall out. Use in the bed and wheelchair 24/7, all year; for maximum benefit. Only authentic Australian Medical Sheepskins have the above stamp on the leather backing. Be aware that some sheepskins offered on the web are tanned to be HiTemp wash but are not UR (Urine Resistant). Look for HITEMP UR on the stamp for the very best products. The Australian Medical Sheepskin Overlay is about 38" long x 28" wide- large enough to protect the body from the shoulders to below the buttocks. Every sheepskin is slightly different from all others. Some are a little longer, others are a little shorter but wider. has been tested in clinical trials and proven to be effective in reducing the incidence of pressure sores. is guaranteed to maintain its properties for 50 washes. has a rigorous set of properties prescribed by Standards Australia. is the BEST available; anywhere. It is recommended that Shear Comfort natural sheepskin products are washed in Woolskin -Sheepskin Shampoo with Conditioner. Woolskin contains antibacterial tea tree oil and is effective against dust mites. If an alternative must be used, it must be a non-ionic liquid detergent which has no enzymes, phosphates, peroxides, alkali or bleach. Tumble dry at low heat and gentle spinning until nearly dry. Complete drying on the back of a chair or drying rack with the leather facing upward. Wool does best with 15% residual moisture. Wash on Gentle Cycle without detergent for approximately 8 minutes in water up to 80oC for thermal disinfection. Wash in Woolskin- the special detergent developed by the tanning industry in Australia. Woolskin will clean, condition and disinfect the wool and the leather. Normal household detergents will damage the leather permanently. This is a first-impressions review; I will update as the product is used. But I will note that we've used other, similar products from this company in the past and we've been very happy with them. I expect to like these sheepskins just as much. For now, I will just say; that they feel wonderful. Warranteed by Shear Comfort to maintain its therapeutic properties for up to 50 washes in Woolskin; provided recommended care procedures are used.